Football Picks ---- for less than $2/game. 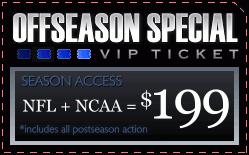 Season Tickets provide login access to weekly Premium Picks. Post-season always included. All information and content provided by www.vegashotsheet.com and Gridline Sports is intended for entertainment purposes only. This information is not intended to violate any federal or state laws. We are not liable for the misuse of this information. Any reliance on such information is at the sole discretion and risk of the user/subscriber. We are not responsible for the content of linked external sites. An external link does not indicate any association with Vegas Hotsheet or Gridline Sports.